Conveyor belts are prone to wearing and tearing so it is of a high importance that their shelf life is prolonged as long as possible. Operated in the mining, construction or general material handling industries, a longer shelf life allows a better function and reduces long term running costs. Rough materials have an effect on conveyor belts so conveyor belt scrapers were introduced as a solution. The belt scrapers are installed parallel to the opposite direction of the material flow and are pressed against the drum in front of the conveyor pulley. This allows for a scraping clean directly below the discharge zone. Because of the CleanScrape’s diagonal positioning, it is in contact with all parts of the drum in front of the pulley. The 5cm wide hardened metal brackets that are vulcanised into the scraper create a bend and tension around the drum using a gas spring tensioner which makes cleaning the belt easier. Australian Belt Cleaning as well as providing these belt scrapers also supply pig segment pieces called chutes. 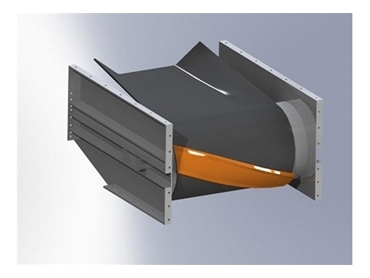 The chutes are manufactured in Germany and the pipe segment pieces and pipe pieces will be mounted on the transfer piece of a connection head (angular to circular) at the transfer curve. There is also a discharge piece with a discharge joint at the end of the transfer station which leads material stream onto the belt in a symmetrical belt load. This will divert the material from one conveyor belt to the next without needing a dump station. This process minimises belt damage and with the CleanScraper allows for a smoother material flow. This in turn results in a longer belt life, less downtime and lower belt, roller and energy costs. CleanScrape is also maintenance free and can be supplied to almost any conveyor belt system without a pattern.